RollUp Solutions Inc. took home the second place prize in our RBC EPIC Business Model Canvas Competition this year. Founder and President, Megan MacKay gave us a little insight into her experience. Check out her blog post below and don’t forget to visit their website for more information (click here)! Consider this. The average cost of a mobility device in Canada is over $2500. More often than not, that device is used for less than a year before it is left behind, destined for storage or a landfill. But, what if that wasn’t the case? What if instead we saved that wheelchair from a landfill, employed someone in desperate need to refurbish it, and then sold the device back to the community at a 75% discount. At RollUP Solutions Inc. this is something we do every single day. RollUP is a social enterprise that strives to remove both social and physical limitations by making mobility affordable for everyone. We are a group of student entrepreneurs that believe taking entrepreneurial action for others creates a better world for us all, and we were inspired to launch RollUP when we learned just how expensive wheelchairs were and how many Canadians are forced to go without due to the high price tag. 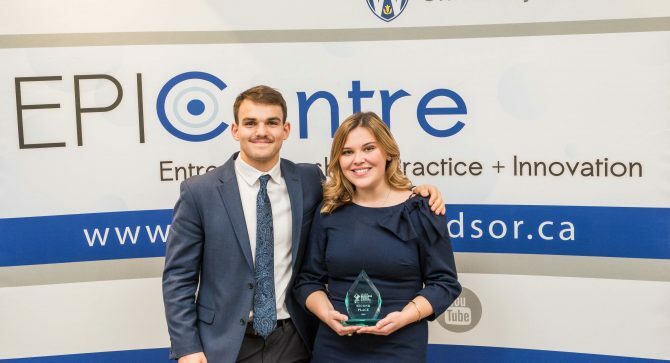 A few weekends ago, we had the opportunity to participate in the RBC EPIC Business Model Canvas Competition, hosted at EPICentre in Windsor, Ontario. Unlike more traditional pitch competitions, this one was different. We were presented with the unique challenge of not only explaining our business but sharing the successes and tribulations along the way. Using the business model canvas, we were able to reflect on our entrepreneurial journey thus far. It was rewarding to explain not only what has gone well over the past year since RollUP was incorporated, but also what hasn’t and the countless learnings along the way. It was an honour to compete with such incredible companies from across the province and receive feedback and coaching from esteemed academics and business professionals. We are grateful for the $2500 prize we received and are looking forward to investing in future growth. Next steps for RollUP include focusing on our digital marketing presence and developing relationships with non-profits and community groups. We just launched our sales platform and are trying to build awareness in Southwestern Ontario, helping make the world a better place one wheelchair at a time. Please click the image below to view all past newsletters.